"STEPPED ON SOMETHING SOFT AND WOBBLY. STRUCK A MATCH, FOUND IT WAS A DEAD CHINAMAN." THE TROUSER PEOPLE is an offbeat tribute to a little-known land of startling human diversity. Pulitzer Prize-winning journalist Andrew Marshall was inspired by diaries he found in London's British Library. They belonged to Sir George Scott, a forgotten Victorian adventurer who hacked, bullied and charmed his way through Burma's uncharted jungles to establish British colonial rule. Born in Scotland in 1851, Scott was a die-hard imperialist with a fondness for supersized pith helmets and a bluffness of expression that bordered on the Pythonesque. "Stepped on something soft and wobbly," he records in his diary one dark night. "Struck a match, found it was a dead Chinaman." But as Marshall discovers by retracing the explorer's footsteps, Scott was also a writer and photographer of rare sensibility. He spent a lifetime documenting the colourful ethnic peoples who still live in Burma's rugged hinterlands, then widened the imperial goalposts in another way. He introduced football to Burma, where today it is a national obsession. Part travelogue, part reportage, Marshall travels from the decaying splendor of Rangoon to the royal capital of Mandalay, then up into the tribal highlands to meet the bewitching "giraffe women" and the former headhunters of the Wild Wa - today, Asia's biggest drug-traffickers. He discovers a nation whose soldiers, like the British colonialists before them, were nicknamed "the trouser people" by sarong-wearing civilians. THE TROUSER PEOPLE is an intrepid and often hilarious journey through Britain's lost heritage - and a powerful exposé of Burma's modern tragedy. This fully revised edition includes a gripping eyewitness account of the Saffron Revolution, the 2007 democratic uprising led by Buddhist monks. "A remarkably good-humoured book. This is not one of those foreign correspondent memoirs where you suspect most of the work has been done in the bar of some Intercontinental hotel. Marshall has been to places where you simply don’t know who may come at you out of the shrubbery, how heavily armed he will be, how fearful of foreigners, and indeed how stoned on whatever local intoxicant is most plentiful." "A witty account of life in today’s diverse and suppressed Burma. Casually weaving relevant political and cultural history into his wry note-taking on what he sees in this largely inaccessible country, Marshall gives us a rare glimpse into the jukes and jibes – both on the pitch and off – of Burma’s mysterious balance of power." "An evocative travel book and an adventure story . . . Marshall is a gifted writer." "Outstanding . . . Marshall provides a vivid firsthand account of conditions in contemporary Burma. Pretending to be a tourist, he travelled throughout much of the country seeking to retrace the steps of the Victorian adventurer sir George Scott. Marshall suggests that life today in Burma may be no better than it was 100 years ago." "It is good to be able to pay Andrew Marshall’s book a fulsome Burmese compliment – his writing is nicely rounded." 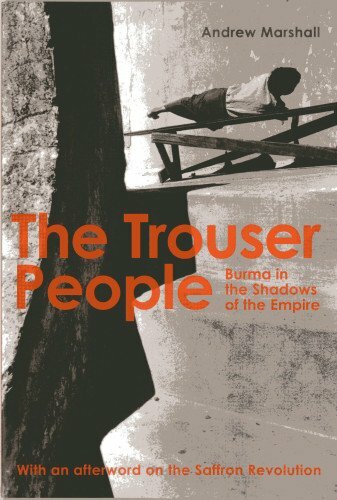 "The Trouser People towers above all other contemporary books on Burma. Marshall’s book is personal without being egocentric, beautifully written, and tells us more about Burma’s past and present troubles than most academic writings." "Immensely readable. Marshall offers a heart-rending view of what life holds for those in the grip of Burma's military dictatorship (and) an unsentimental exposé of the craziness and cruelty that is Burma today." "Hilarious. Few books I have read have contained so many fascinating stories." "Marshall emerges from these pages as an extraordinarily intrepid traveller and trustworthy narrator whose account will make readers want to hop on the next plane to Rangoon to help overthrow the general’s corrupt, narcodollar-fed regime. Excellent from first word to last." Marshall has travelled bravely, and his Brit-gonzo journalism made me laugh, think and look very hard at places and people that disappear off our mental map." ANDREW MARSHALL is a Pulitzer Prize-winning British journalist and author. Marshall spent two decades exploring Asia's remotest places for TIME and other big publications, including National Geographic, Esquire, GQ and The Sunday Times Magazine. In January 2012 he joined Reuters news agency where, as Southeast Asia Special Correspondent, he writes investigative stories about crime, conflict and human rights. In 2014, he and Reuters colleague Jason Szep won the Pulitzer Prize in International Reporting for what the Pulitzer judges called "their courageous reports on the violent persecution of the Rohingya, a Muslim minority in Myanmar that . . . often falls victim to predatory human-trafficking networks." In the same year, he and Szep were awarded the prestigious Osborn Elliott Prize For Excellence in Journalism on Asia. Marshall has also won three Society of Publishers in Asia (SOPA) Awards for Editorial Excellence for his reporting for TIME magazine, and four more with his Reuters colleagues. He is the author of two non-fiction books which have been translated into 10 languages. THE TROUSER PEOPLE was a New York Times Notable Book. He is also co-author of "The Cult at the End of the World," a prescient account of Japan’s homicidal Aum cult and the rise of high-tech terrorism. He has co-produced three documentaries for Al Jazeera - on cholera epidemics in Bangladesh, military torture in Thailand and drug users in Malaysia and Indonesia - and acted as a consultant on a fourth for Channel 4, about apocalypse culture in Israel, Japan and the U.S. THE YAO OR THE YO." In 1891 George Scott began work on his great five-volume Gazetteer of Upper Burma and the Shan States. Brick thick and turgid with detail, gazetteers were the blunt instruments of colonial administration. Today they squat, massive and many-volumed, on forgotten shelves in library basements, dusty reminders that the Empire was won not just by force of arms, but also by sheer tonnage of paperwork. They are psychotically fastidious. Scott’s Gazetteer records every man, woman, child, bullock, buffalo, cow, pig and pony in the Shan states, along with the geography, ethnicity and chief produce of even the smallest village. Nothing escapes its omniscient sweep. It knows, for example, that the saopha’s revenue from opium and liquor in Hsipaw State in 1897-8 was 18,132 rupees. It knows that in Kengteng five annas will buy you four duck eggs and still leave change for a custard apple. But Scott’s Gazetteer was much more than a dry imperial stocktaking. It was a fathomless resource on the origins, customs and languages of Burma’s ethnic peoples, written not in the stilted prose of a bureaucrat, but with the flair and passion of an experienced journalist. Even a century after its publication, the Gazetteer had an almost biblical authority. In Burma I met an American gem-dealer and a Canadian Red Cross worker who both swore by Scott’s magnum opus. I bought my treasured copy at a Rangoon bookshop. It wasn’t great bedtime reading; that would be like propping the Ten Commandments on your chest. But with a firm table, and some quality time, the Gazetteer was endlessly absorbing. I now knew that Kachin warriors usually make war just before the moon rises, and make love in purpose-built ‘bachelors’ huts’ – the love hotels of the jungle. I had learned the crucial difference between the Banyôk people (who worship their dogs in an annual ceremony) and the En (who eat them). I had followed Scott’s brief exegesis on the Karen’s use of chicken bones to divine the future. I knew that the Kachin believe that the movement of giant subterranean crocodiles causes earthquakes, while the Eastern Tai are convinced that eclipses are the work of a moon- swallowing frog who must be frightened off by gong-beating and gunfire. I no longer confuse the Yindu people with the Yaw, the Yao or the Yo. THE TROUSER PEOPLE is available on Kindle and at all good bookstores. And at some bad ones, too. And finally . . . Hugh Laurie and Stephen Fry discuss The Trouser People on "Q.I."